As we are frequently visiting these areas, more about The Kalahari Desert. The Kalahari Desert (in Afrikaans Kalahari-woestyn) is a large semi-arid sandy savannah in southern Africa extending 900,000 square kilometres (350,000 sq mi), covering much of Botswana and parts of Namibia and South Africa. A semi-desert, with huge tracts of excellent grazing after good rains, the Kalahari supports more animals and plants than a true desert, such as the Namib Desert to the west. There are small amounts of rainfall and the summer temperature is very high. The driest areas usually receive 110–200 millimetres (4.3–7.9 in) of rain per year, and the wettest just a little over 500 millimetres (20 in). The surrounding Kalahari Basin covers over 2,500,000 square kilometres (970,000 sq mi) extending farther into Botswana, Namibia and South Africa, and encroaching into parts ofAngola, Zambia and Zimbabwe. The Kalahari is home to many migratory birds and animals. Previously havens for wild animals from elephants to giraffes, and for predators such as lions and cheetahs, the riverbeds are now mostly grazing spots, though leopards and cheetahs can still be found. The area is now heavily grazed and cattle fences restrict the movement of wildlife. 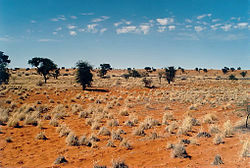 Among deserts of the southern hemisphere, the Kalahari most closely resembles some Australian deserts in its latitude and its mode of formation.